Most modern businesses have a company website. To add your listing to Roofer-Locator.com for free all we ask is that you put a small, unobtrusive link (often times placed at the bottom) of your website homepage to us. The simple HTML code to do this can be copied from the text box below. Either send this code to your webmaster, or simply copy and paste the code below to your website in the location you would like the link to appear. Please have the link in place before submitting your listing. 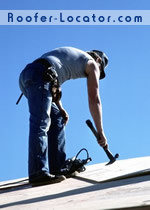 All listing submissions are reviewed before being posted to Roofer-Locator.com.